OK, so it isn't a new year, but it feels like it for me as I have been doing so much pondering lately about the directions I want to take with my art and what my priorities should be. There are so many opportunities available to me that I am having a hard time paring it down and deciding what to devote time to. This summer was a time spent in thought, remembrance, and grief. Even now my eyes well up thinking about a great loss in my life, but I am also ready to move ahead and find strength in the talents, abilities, and support that have been given to me and try to use them wisely. I finally do not wake every morning in painful remembrance and I have found some creative inspiration in the studio. I have begun organizing and reorganizing my studio space and hope to finish that before the month is over. It means moving much of it out so I can move cabinetry in and then find a place for everything in a bit more organized way. It is moving along and I am happy with it so far. I had two articles submitted to magazines and one of the magazines went out of business and the other, after about 7 months of sitting on the article, chose not to use it. I have not written anything since this past Spring so will have to think about doing that, or maybe submitting those articles elsewhere. I think they are good, just need to find the right place for them. Finding topics to write about does not seem to come easy for me, especially since you have to consider where you might be able to have them published. Options are limited in that regard, particularly for non-traditional quilt artists! I have the opportunity to teach locally, and maybe wider if I would choose to. 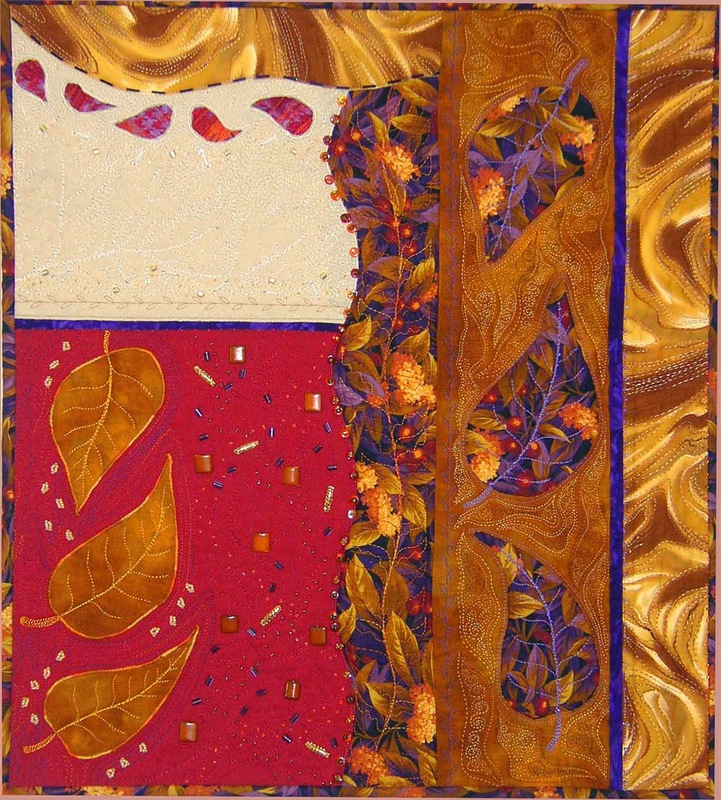 I have been asked to develop classes in both embellishment and home machine quilting on art quilts. These take me a lot of time to organize and lay out, particularly a beading one since I feel I would probably have to provide a kit so everyone had the same materials. Lots of time for prep, and again, this does not come easy for me. I do enjoy the actual class time very much and look forward to teaching more, if I can just get myself to spend the time getting them ready to teach! I would like to get a few more classes in my repertoire so I can market myself to guilds in the region and do a lecture/trunk show/full day class thing. Lastly, I am in the market for a new gallery or two and would like to find ones that are higher end that can sell my larger (translate: higher priced) pieces. I will be contacting a gallery in New York that I recently found out about and will be looking around Portland when I am there in April for the Studio Art Quilt Associates Conference. I have a show currently booked at the Lewistown Art Center with another artist, Denise Pfau, who does lovely gourds with weaving, painting, carving, beading, fiber, etc... We are a good match and our show will be beautiful I'm sure. Locally my gallery opportunities are minimal and the ones I do have can only sell my small, low-priced pieces. That is just the market we are in here. I want to get my work somewhere where people are spending money on art and see how it does. I get so many positive and enthusiastic comments and reactions to my work that I feel like I might be successful if I can just get my work into the right markets. There is not enough time in the day to do everything I would like to, and do it well--I don't suppose I'm unique that way!! I have a son in school who also needs my time, and I have a household to keep up. I need to spend time with family and I have several art and quilt related organizations that I am involved with and that require time and effort. There is always something coming up, a new challenge, a local show, a fundraising effort, a request for volunteers, a crisis. There is no time to waste on surfing the internet, pinning images on Pinterest, posting and reading Facebook posts, or, worst of all, playing games! Yet those things do take up my time and I am hoping to change that. So, a New Year it is for me. I'm making my resolution now to prioritize, organize, not procrastinate, and use my time wisely! Nothing new here. Those are probably the most common resolutions around---along with losing weight which I should do as well! A recent sermon at our church was about change and how difficult it is for people to deal with, but how it is inevitable in our lives. Many times we do not welcome it, even though there may be good that comes from it. I have very recently had a major change in my life and it is a difficult thing to accept. Life is easier when things just go along everyday and nothing interrupts your routine. But when something happens that is unexpected or disruptive or just changes the way you feel about where you are in life, then we find it most distressing and uncomfortable. At first we might try to deny it, then we may grieve about what the change has brought or we have lost through the change, and then we finally accept it and learn how to go on. When I create my art I usually feel very comfortable, free, and happy about how things come together. Just being able to touch and see the woven texture and color of the cloth is good. I enjoy the process and where it takes me. I've been given a talent that I never knew I had most of my life and it has changed my life. Change can be good. This change was good for me. I now have a real passion and love for something I can do, and some success in pursuing it. I have been rewarded many times over with having my work in juried shows, solo exhibitions, winning awards, having people purchase my work, and having many people just enjoying and sharing with me how much they like my work. I heard Jay Leno in an interview recently talking about how great it is for him that he gets to hear applause every day---how can that not be great? He was very appreciative of that and he realizes that not every person gets that kind of appraisal every day like he does. I know as an artist how much that support and encouragement means and how, even though most artists can't NOT create, it helps spur us on to keep creating and sharing our work. If you have a friend or family member who is an artist and they show their work or share it with you, give them encouragement. Pursuing art is a inward, solitary activity mostly, but sharing and showing it is exposing yourself and your feelings and talent in a vulnerable way. I have appreciated individuals who come to every one of my shows or visit wherever my work is displayed because it feels very supportive and it motivates me to create. When your friend or relative shows you the new work for an upcoming show, you have already seen it and therefore don't need to attend the opening reception or even visit the venue to look at the work, right? Wrong. If you are a friend and want to support and encourage that person in what they are doing you will go and see how great their work looks displayed in a careful, considered way at whatever venue it might be that honored her by agreeing to show her art. It is the enjoyment that people get from my work that makes me most happy and when they share their feelings about my art I am thrilled that they took the time to go see it and to let me know that they liked it. I am honored that people make the effort to go see my work when it is displayed. Someday I would like someone to write a review of one of my shows and describe what they saw, felt, liked, didn't like, and why. I would try to learn from it all and hope that others would too. It is hard to take the bad with the good sometimes so being reviewed is kind of scary. Change is that way. Sometimes change looks like it is going to be a bad thing and we are never going to be able to accept it or live with it. But we do. We move on, we learn how to adjust and adapt, we look back and remember fondly what we have lost, but we also look forward to what we can do and where we can go inspite of or because of the change. Change is scary. Change makes us nervous, tense, and unsure of what lies ahead. Sometimes it makes us very sad. We want to know, will we be able to cope, will we ever be the same, will we be able to go on... Yes, we can cope and we can go on, although it is true, we may never be just the same because of change. I know I can accept it, embrace it, have fond memories of it, and use it to make myself and my art more, better, braver, and stronger. The sadness will subside over time, the courage and perseverance that takes over will influence my work. The change will influence my work. Sorrow will be replaced by beauty and great respect for a life worth living. I think you need to embrace change and use it to stimulate your work, your life, and your relationships. Change is inevitable, not always welcome, and usually not easy to deal with. Most people do not like change. But, I'm going to do my best to honor what I have lost, share the beauty of my art and the talent that was passed down to me, inspire others, and be happy. The tour started rather slowly on Friday but I did have some sales and was happy with that. I was able to recover what I had spent to be a member of AAB and prepare for the tour. On Saturday we had much better traffic and I did very well with sales. Sunday was slow again with very few sales for any of us. I was able to borrow some display panels with lights from my father who used to use them to take his watercolor bird paintings to shows. They worked great for hanging my art quilts and the lights were definitely a valuable part of the setup as they show off the quilting and detail of my work. I also had a display rack that I showed in a previous blog post which holds 15 quilts in a small space. This was one of the pieces I sold to a very lovely woman named Collette with what I believe was a French accent. This is a piece I love and she assured me she did too! It is called "Joy In The Morning". The tour was extremely enjoyable for me as there were many, many visitors who were highly complimentary about my work. Many people had never seen art quilts or at least nothing like my work, and they seemed to love everything I had on display---which was a lot! I am rather prolific and I figured I would get as much displayed as I could so there was a lot to choose from. I debated about whether or not I should include the small ornaments I make and even the slightly larger mini quilts. Sometimes it seems people will buy those even though they like the larger work because they are more inexpensive (cheap!). I did end up showing both and often someone would buy more than one so the sales did add up quickly. Also, luckily there were a number of patrons who liked my mid-size pieces which is what I make most and have the most of, and I sold four of those. Here's another piece that I sold and will miss because I really like it on my own wall and have enjoyed it. It is called "Autumn Royalty". It was sold to another artist who does work that I greatly admire so I was thrilled that she and her husband both love the piece. I am now getting things back in order so I can prepare for my next adventure which is a featured artist exhibit at The Purple Pomegranate gallery in Whitefish, Montana. This is a beautiful town that gets a lot of tourist/summer traffic so they expect to get quite a crowd at the opening which is July 3. I plan to be there for the opening and I'm looking forward to seeing how my work does in this new venue. If it does well I may be able to continue showing some of my work at the gallery. "A Slice of Clear Water"
I will be teaching my Strata Art Quilt class at Timeless Quilts in Missoula, Montana on August 16. The class will be from 9:30am-3:30pm and the cost is $45.00. The shop has a description of the class and a supply list and I will be taking in a couple of sample wallhangings in the next week or so. I think they will be advertising the class after June 1 so you will be able to sign up then. This style of quilt was featured in my article in the October 2013 issue of The Quilt Life magazine. 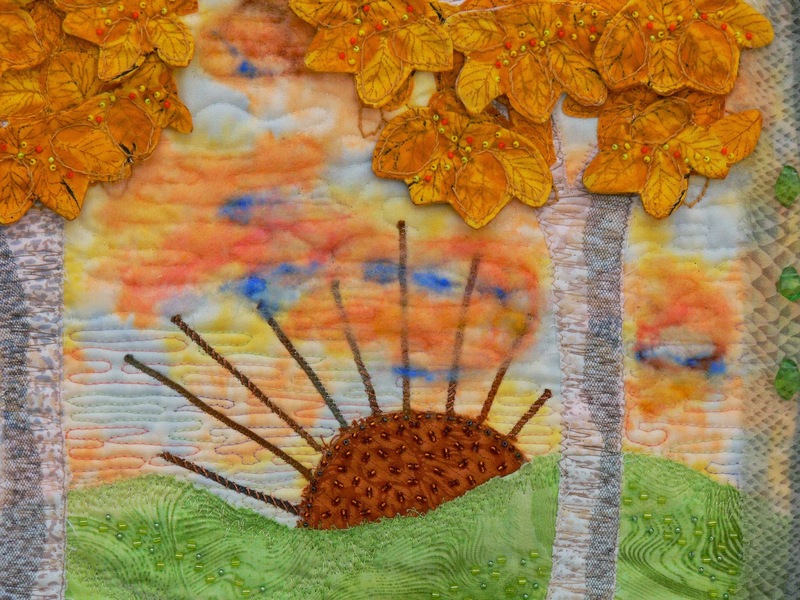 The one-day class involves designing and completing the top, but there will examples and discussion about quilting and embellishing the finished piece as well. I will also be working up an embellishing class hopefully to offer in Fall 2014. Let me know if you have any questions or need information about the class. You can e-mail me at heidi@heidizielinski.com. There are so many color combos in nature that inspire my art. Here is an example from my yard this morning. A beautiful Lazuli Bunting that hopped around eating seeds from dandelions and perching on the various bird feeders we have. One of my favorite birds!! My husband and I worked together to create a display rack for some of my quilts that I will use during the Artists Along The Bitterroot Studio Tour which is coming up June 6-8. I wanted some way to display a number of pieces without using up hanging space or stacking them on a table. I drew out a design that I thought would work and my husband agreed to put it together for me. I will also have wall panels in my space for displaying a number of my pieces, but I have so many that I thought it would be good to try this option for displaying some of them. Two things I asked my husband to do before he did the final design of the rack, was to make sure it could come apart for storage---I suggested using wingnuts for this purpose. Also I wanted to be able to have at least 12 art pieces on it. I gave him a general width and height for the front and back of the stand. I'm not a draftsman and I don't do woodworking, so my sketch was just a rough outline of what I wanted with a few measurements that I thought were important. So this is what my husband made for me. I don't have all my long dowel rods yet so the ones I show here are just whatever I could find in my studio, and some of them are longer than they will end up being. I wanted to be able to grab the rod on the side to lift up the quilt, but not have them so long that they get in the way of people moving through my "studio". I wanted to see what it would look like with all the pieces on it so I filled it up with quilts. It actually holds 15 wallhangings and I think it is pretty functional and attractive. It will work great for my "studio" space (which isn't in my studio since I'm sharing with another artist in her alpaca barn along with two other artists). The footprint of the rack is 39"deep by 28"w (not including the dowel rods) and the front is 30"h, back is 52"h. I think it displays my work rather nicely in a fairly compact way. I like that they are hanging and just far enough apart so you can pick them up and look at them without any beads catching on the next one. A big thank you to my husband for making my design work! I couldn't have done it myself, but working together we came up with a good thing! Catalogs are available at many businesses in the Bitterroot and Missoula. 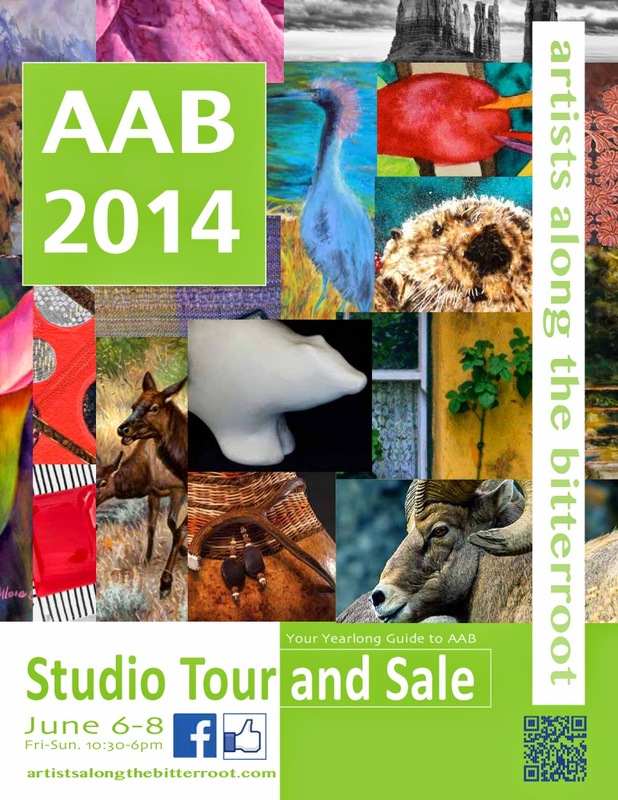 There is no fee for the tour and you can go to as many studios as you like. There are many excellent artists in the valley and this is a great opportunity to meet some of them. Artists will have art for sale and will be happy to talk with you about what they do and how they do it. I will be sharing "studio" space with three other artists at Shelley Peters' alpaca barn on Bass Ln. Denise Pfau and Merle Ann Loman will also be at this location. Please visit us! Approaching a new gallery is always somewhat daunting, especially when you are at the stage of development with your artistic endeavors that I am. I have been showing in local/regional galleries for about 5 years now and doing ok with that, but I am interested in getting my work into some higher end markets and more sophisticated venues. In order to sell anything in local markets I have developed pricing that I can live with that is somewhat commensurate with what the market here will bear. That isn't much! I do pretty well with tourist traffic through one of my galleries as they are willing to pay the prices, but locals not so much. As I make the brave step of proposing my work to higher end venues/galleries, I feel like I am shooting myself in the foot by telling them what my current price points are for my work. Most of these venues are going to want higher priced artwork than what my work is currently at---and so do I! That's why I'm approaching them! So how do I give an answer to that question in an honest way without having them shut down any interest they might have in my work? I currently am working through this situation with a gallery and waiting to hear if I have "under-priced" myself right out of the running. The fact that they even inquired as to my price point after I sent them images of my work seems to imply that they liked the work, so that was promising and encouraging. Then I had to debate about what to tell them about my prices and I went with the honest answer with a caveat that I'm seeking to find a better market and get those prices up more where I think they should be. In order to survive and pay bills and buy supplies I need to be able to sell either my art or my knowledge about my art in the form of magazine articles or teaching. When I price my work I have to consider the market I have available to me, but I have also started pricing my work a little higher because of having some success with sales and exposure of my work---and the fact that I think my work is getting better all the time. That means my local sales have slowed, but I'm hoping that it will prepare me for getting into one of the higher end venues that I'm looking for. Thinking long term here which can be painful in the short run! Catch 22 right? How to survive while you develop a following and some recognition for what you do so you can move on to bigger and better things. I'm thinking I need to lean towards the teaching and writing for the income and start getting my prices up so I can approach the venues I aspire to with my head held high. I'm not ashamed of my prices, but I sure would like to get what I think my work is worth. One of my galleries is going to be closing at the end of June, but I think that creates the perfect opportunity for me to seek out the type of venue I'd really like to have for my work. I get a great positive response to my work in all the venues I show in, but the sales don't necessarily follow because the clientele is not spending that kind of money in those venues. I would say I do better than lots of the artists trying to sell at the same price level, but not good enough for me. So I'm moving ahead and looking forward to finding a new opportunity for showing and selling my work someplace that will showcase it to its best advantage and be able to garner the level of sales that I think it deserves. Wish me luck!! I have just finished beading and putting a label and sleeve on my 2014 Studio Art Quilt Associates (SAQA) on-line auction donation. The pieces have to be 12"x12". Mine is made from hand-dyed fabrics and there is beading around all the edges. It is called "Simplify, Simplify". Go to the SAQA Auction page to see all the beautiful entries and find out how to bid on them when the auction starts on September 15, 2014. It is a reverse auction so they start at $750 and go down each day until they get to $75. I actually made this piece for a hand-dyed challenge proposed by Visions Art Museum but decided that it might be too simple for that exhibition, so I made another piece that I sent to them. I didn't want to bead on the surface of this piece because anything I seemed to try out on it just took away from the simple beauty of the rich hand-dyed fabrics and free motion stitching. I stuck to beading around the edges to kind of frame the piece and left it at that. Now that my family and I have come into the 21st century with highspeed internet, I have joined Facebook and posted some things out there. We had dial-up access for so long that I have never really done much surfing and don't even know how Facebook works so it is all a learning thing for me! I only have 7 friends out there so far, but hope that I will get some fiber artist friends soon! My mom has been in the hospital for the past two weeks so I have been rather preoccupied with driving into Missoula every day (over an hour round trip) and visiting her. She just came home today, although they haven't been able to the necessary heart artificial valve repair/replacement surgery because things have been complicated by a stroke. She will be home doing some healing from the stroke until they tell her to come back for the surgery. That could be a month or two out. Now that she is home, which is just 10 minutes from me, and she has a nice sewing studio, I will likely get back to work creating something. I need some new pieces for my upcoming studio tour and for my solo exhibition in Whitefish at the Purple Pomegranate in July. I'll also be working on a 12x12 SAQA auction quilt to donate for their on-line auction. Enjoy the spring weather and visit me on Facebook! I have made quite a few of these small fiber art pieces that start out about 6"x8" (more or less) and have a tab top with rod for hanging and beads dangling at the bottom. Sometimes I have added beads on the pieces but not always. I have had great fun choosing fabrics and quilting these little works, and I do plan to do more. I find that the size of these pieces allow me enough space to play with some fabric combinations and do some nice quilting and beading, but they don't take long to make and they can be priced at a good pricepoint for sales in my galleries. Unlike the little ornaments I have made, I feel that I can put enough of my artistic style and artistry into the work to find them fulfilling and enjoyable to create. I'm sure that every single blogger who loves and enjoys nature will be writing a post about the coming of Spring---and this year how particularly welcome it is! Not to be left out, here is my pictorial review of the heavy snows of winter and the flooding of early March. I live in the Bitterroot Valley at the base of the Rocky Mountains in Western Montana. I look to the west at the Bitterroot Mountains and to the east at the Sapphire Mountains and down our valley runs the beautiful Bitterroot River. I live just a couple miles from the Lee Metcalf Wildlife Refuge which has pond, woodland, prairie, and river habitats for birds and animals. In short, this is a beautiful place full of life and we appreciate it all every day. That's why we live here--because it ain't for the money we can make!! This was a particularly wintery winter with cold temps and abundant snow. We talk here in terms of the "snowpack" because the amount of snow we get in the mountains over the winter will determine how much irrigation water there will be for the ranchers and landowners here in the valley. When I was a kid growing up just north of here in Missoula, Montana we had many winters with lots of snow which stuck around, but in the recent decade the winters have been rather mild in comparison and that made this winter seem all the more wintery. This is my front yard in February and as you can see we had a beautiful day when I couldn't resist grabbing my camera and snapping a few choice pics of the landscape I was enjoying out my window. We feed the birds year-round and this is one of our feeder stations covered with snow. The birds didn't like all the snow on the top as they usually perch there and the snow was too deep and soft for them! That's the Bitterroot mountains behind the feeder. Because the ground was very frozen and we got a good rain with warmer temps, all that snow turned into a one day scary flood situation for many of us in the valley. We live on Three Mile Creek (it runs along our back yard boundary), and it usually gets high every spring but doesn't threaten our home or property too much. This year it was very very high on this day in early March and I could see a lake out my bedroom window that was never there before! I watched the waters rising all day and finally called my husband and he came home early to help me worry about it! We did go and fill some sandbags at the local fire hall and stacked them up behind our garage to hopefully prevent some flooding there. The waters actually stopped rising and held steady and then as the night got colder the melting subsided. By morning it was not a lake anymore but had turned back into a creek and it has pretty much stayed that way. Here is what the creek looked like the next day and what it is supposed to look like! Ahhh, much better! Lots of sand was deposited in the area under all those trees which is usually where our neighbor has their fire pit and enjoys summer bonfires. That area has never flooded in the more than 12 years that we have lived here. There's always a first time for everything! The weather then proceeded to melt much of the heavy snow we had accumulated in a reasonably quick way, and now that Spring is here in April the creek is rushing along in its little channel, and behaving itself nicely. I'm not sure if you can actually see with my pictures the dramatic change there was to this little bit of landscape during this flooding, but I can tell you that I was very nervous. If the creek had risen 12 more inches I think it would have been flowing into the crawl space of our house and into our two garage areas. That was not a comfortable feeling, and I'm glad those kinds of high waters are very uncommon. It was a certain set of circumstances and timing that caused it to happen in the winter of 2014. May it never come again as long as I live here! In Spring 2013 I had an article in The Quilt Life magazine about Strata Art Quilts. These are long narrow quilts that are made up of horizontal strips of fabric. I have made quite a few of these quilts because I enjoy the process of selecting fabric and designing the pieces, and then quilting and beading them. I have taught a class on making them twice now and I think all of the students really enjoyed the process. It was very fun helping them with their pieces. 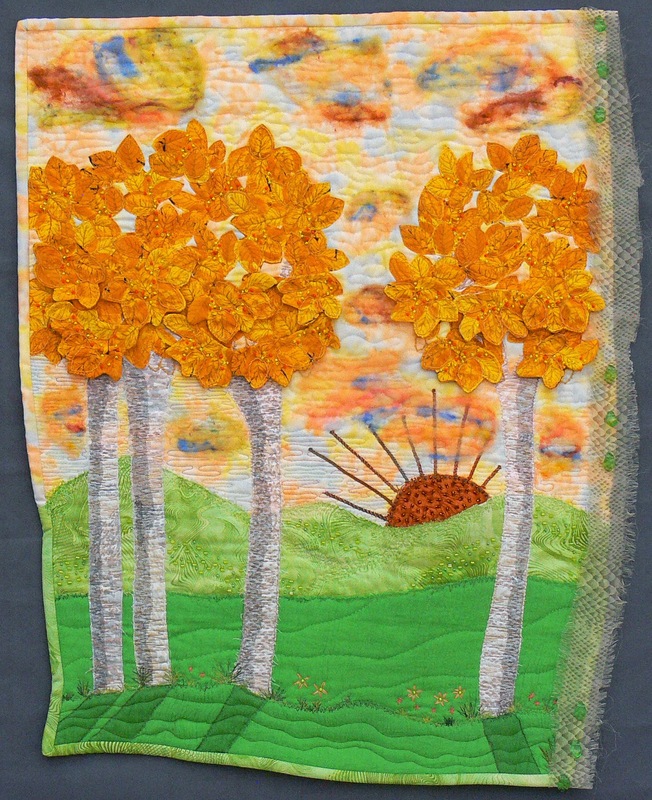 Here is the most recent piece I made, which was included in a recent blog post where I showed pictures of our fiber art show where they showed a bunch of Strata quilts made by my friends and fellow art quilters. I thought I would show you a little better image of it and some detail. This piece is 7-1/2" x 28". Sorry the photos are not my best! The piece is called "It's A Hoot" and is priced at $160.00. One of my favorite parts of the quilting process is choosing fabrics to put together and the Strata Art quilts are very fun to do. The quilting and beading don't take long because the pieces are so narrow. Our fiber art group had a playday several months ago and created fabric using Itajime Shibori, which is using clamps for resist dyeing fabric. One of our members hosted the activity in her large garage and we used plastic clips of various sizes for the "clamps". We folded the fabric in a way that usually produced a sunburst, tie-dye sort of pattern when it was unfolded, something I'm not really fond of and find hard to use in my pieces. But it was definitely a fun time and we were glad our friend allowed us to use all her dye and make a mess in her garage! At the end of the session we had to take our piece home and let them sit for 24 hours before we could reveal the results. What agony! But the thing I love most about any type of shibori dyeing is the reveal. Always fun to see what you get and to find something unexpectedly wonderful--as it usually is! The design reminds me of Frank Lloyd Wright and I think it would go nicely in a home of that style. 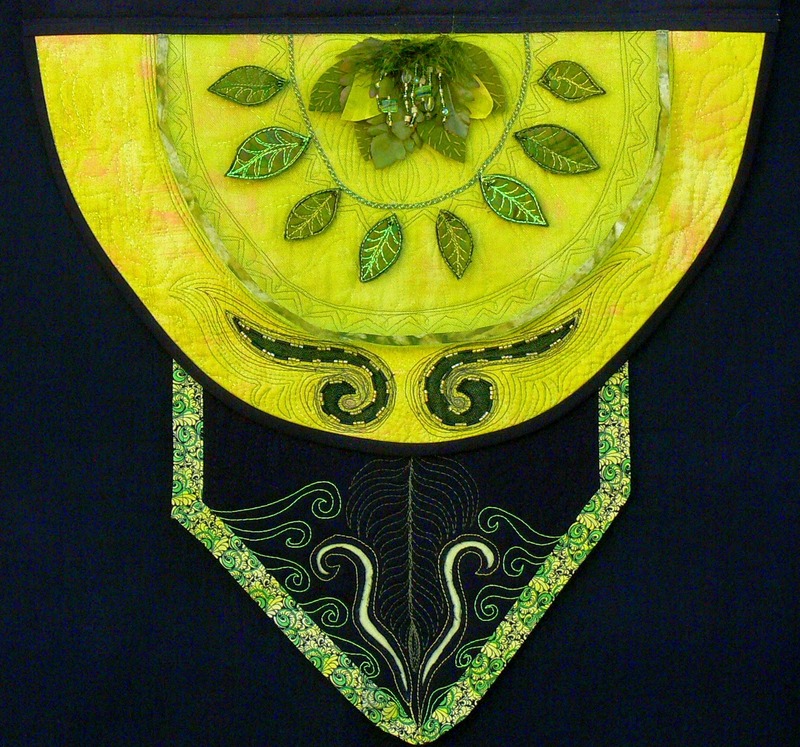 The fabric in the inner border is a commercial print that was in my stash. I was looking for something to put around the center section after I finished it and this piece seemed just perfect. I like the drama of the dark maroon fabric with the dyed shibori piece and think that it is what makes the piece appealing to my eyes. I don't really care for the greyed tones of my dyed fabric and the dark maroon fabric and the print border fabric both bring some brightness to the piece. I have another piece of the shibori dyed fabric which has a very strange color combination in it and it will be harder to use. There are parts of it that are pretty good though so it may be used only in pieces instead of the whole piece as I did for the one above. Or I could over dye it and maybe some of the unnatural bright green that is in it will get toned down. Haven't quite decided and have moved on now, but someday I'll get back to it or find it, or parts of it, useful for something I am working on. You never know! Every year in February there is a local fiber art show called "An Affair of the HeART" showcasing the numerous fiber artists in the Bitterroot Valley and Missoula, Montana. They always hold a challenge for any artists who wish to participate and this year's challenge related to Alice in Wonderland. We were each given a page out of the book and a maximum size for the piece. Other than that we were free to create our pieces however we wanted. Challenges are a unique creative process for me. When I make most of my pieces I work completely by inspiration from cloth or color, but when I am given specific challenge parameters I have to work off someone else's inspiration to make something---and that for me is the greatest challenge. After a number of years of doing these challenges, I have come to the conclusion that I need to stay in my comfort zone and with the style of work that I am accustomed to doing rather than trying to do something that is very different just to meet the challenge theme or parameters. I have not been happy with pieces I have done that aren't in my own style and they are not pieces that I am proud to show in other venues. My page told about when Alice drank from a bottle and grew inside a house so that her foot was out the chimney and her arm out the window. I originally thought of a unique 3-dimensional piece that would incorporate a house with the arm and leg coming out as stuffed doll parts. This would be intriguing and fun for the audience--but not for me!! I don't do this type of thing in my work and after trying to think about how I would do it and not feeling good about it, I finally talked myself out of it and went another direction. My pieces are usually simple in their construction and basic design. Then they become more complex through the quilting and embellishing. I decided to make a simple stamp of the bottle and use that to inspire the piece. I drew out numerous bottle shapes and finally hit upon one I liked. I drew it onto a piece of craft foam with a pen and then cut it out. I "etched" some lines for details on the neck of the bottle and a tag hanging around the bottle neck using a ball-point stylus. I glued the craft foam onto a piece of cardboard which I could hold onto for stamping. Using black and gold fabric paints I brushed paint onto the stamp with a foam brush and then stamped onto my background piece. That background was simply a color block pieced top with a neutral and a red piece of linen, a vertical pieced strip of mostly red prints, and a turquoise strip of some old linen-like fabric that I had once made a shirt out of way back when I did that kind of thing. The bottle images were stamped onto the linen fabrics in a hopefully artistic way, kind of cascading down the piece. Some of the images are from the second stamping so the paint is more faint. This adds interest so that some of the images are more bold and others more transparent. I loved how the texture of the craft foam stamp applied the paint to the fabric. It was not even and smooth, and that was perfect. After the paint dried I quilted the piece and then added quite a bit of beading, including some fringe at the bottom. I bound the piece in black fabric with a red batik flange as a detail and then couched a black yarn around the edge between the two, which added a nice, interesting texture. I felt very good about the piece in its simplicity and subtle communication of the challenge inspiration. I think the bottle image is unmistakably Alice's bottle and yet it doesn't scream "Alice In Wonderland". I will be proud to show this piece in any of my galleries. It won 3rd place in the Viewer's Choice voting for the challenge and I received a lovely packet of dyed fabric, dyed embroidery floss, and a fiber art book. It was much more satisfying to create this piece that reflects my style of artistry rather than to try to fit into the parameters of a challenge and try to make something that the audience will like. I find that the audience does like my style and I don't need to try to get fancy or complicated in order to be successful in a challenge. Having a piece that many of the viewer's could recognize as my work is a good thing because it means I have a relatively cohesive style. For now, I'm sticking with it!! See my article in the March issue of American Quilter called "Stamp and Stitch" that talks about using stamping to create a piece then using the stamped imagery to get you started with your quilting. The piece in the article is a wholecloth painted piece, but I have done many using various border arrangements (kind of like this one) or a log cabin type surround. Fun stuff---class is in the works for this! I have been showing my work at a gallery in Billings, Montana, called Bailiwicks on Grand since sometime last summer (2013). In April 2014 they will be having a miniatures show of many art mediums. The owner requested pieces that are 6”x8” or smaller so I have been doing some small pieces that are very fun to make. The problem with these pieces is the amount of time it takes to make won't be recovered at a price that I can sell them for. It takes me as long to complete one of these as it does to do the quilting on a much larger piece. The finishing in particular takes a lot of time---making a binding or facing, adding tabs at the top for a rod, cutting/sanding/painting the rod, and adding a label. They turn out very pretty and are a good representation of what I do as I am able to incorporate a bit of nice quilting and some beading, as well as combining fabrics in an interesting way. Luckily they are VERY fun to do and I think they will sell if I can choose the right price point for them. If I sold them myself it wouldn't be a problem, but with a gallery commission taking a good bite out of it, the pricing is a challenge! Below are some of the pieces I have sent off to the gallery. I particularly like the purple one with the circles. The purple feather is on a silk dupioni fabric which shows off the quilting very nicely. I have made about 18 of these little quilts so far and intend to do more. You can find them at Bailiwicks on Grand in Billings and at The Artist's Shop in Missoula and they are currently priced at $50.00. At a recent local fiber art show, An Affair of the HeART, a number of artists created “Strata Art Quilts” based on my article last fall in The Quilt Life magazine. They displayed them all together and it was very interesting to see the variety of styles, skill levels, and variations on the basic theme. I was honored that so many have taken the time to try this very fun style of art quilt. I think most of them found a fun way to play with fabric, quilting, and beading on a small scale. An image of these quilts and an e-mail about them that I recently sent to the editor of The Quilt Life will be published in an upcoming issue of the magazine so look for it! I have started my year off by taking some chances. I have submitted some articles that might not be quite what the magazines are looking for, but I am hoping they might take a chance on me anyways. One of the most difficult things about my effort to write and submit articles to magazines has been trying to find the right place for them. I tend to write like I create my art---by inspiration. So whatever I am inspired to write I write, rather than writing what I think a particular magazine might be interested in. This means I then have to think about where it might be the best fit with the publications that I am familiar with. The problem is that much of what I write is from an artist or art quilter point of view rather than a quilter's point of view which means that many traditional quilters may not relate to what I have to say. Even as an art quilter there may be part of that audience that wouldn't be interested in the more business related aspects of my creative efforts. I am always working on my business whether it is maintaining contacts, marketing my work and myself, communicating with potential customers and fellow artists/quilters, or keeping up with show entries and paperwork. Not to mention trying to create art! I have many friends and acquaintances in the quilting world and in the art quilting world. There are a lot of art quilters in my area as there has been a local effort to nurture them and keep an active community. Unfortunately, very few are pursuing their art as business as I am. The people who I feel closest to in what I am doing are the longarm quilters who are also busy marketing and nurturing clientele. I have one friend who has written a book and is writing another about quilting, mostly traditional, and she has been a good source of encouragement as we try to reach outside our active but limited local community of quilters/art quilters. So, wishing that I had the support of others working towards the same goals and wishing there were more options for publication of the types of articles I am inspired to write (and pay me for them! ), I am struggling with my efforts and just hoping that the magazines that do exist will like what I write enough to give it some space in one of their issues--but I'm not holding my breath! And I'm hoping that maybe I will soon find some like-minded individuals in a new effort I am hoping to undertake this spring. I have applied for participation in a local artists group that sponsors a studio tour which has become popular and quite successful for the participant artists. I admire many of these artists and look forward to interacting with them more about what we are trying to do to market and promote our creative endeavors. So, wish me luck in whatever I decide to tackle next and let's hope that one of the magazines agrees to give me a shot and publish my writing. The waiting is always difficult and the rejections even more so, but I keep trying and I've had enough success to have a positive outlook and hopeful attitude. I have had 3 articles published already so I know that they like my writing style. It is just the trick of finding the right topic for them to fit into one of their issues. I'll keep writing and I'll keep submitting and who knows.....! I am teaching my "Strata Art Quilt" class again so I thought I better put it out here in case someone in this area happens to read my blog---don't think it happens very often but I'll give it a go anyways! Call or visit Vicki's to sign up, get a class supply list and see the sample quilt and magazine article about this easy art quilt that is a great way to learn about design. Please feel free to e-mail me at heidi@heidizielinski.com if you have questions or want some more information. The class will cover how to use some basic design principles to create a beautiful long narrow wall-hanging that is made up of varying widths of strips. The small spaces created by these strips are great places to practice doing free motion quilting and maybe even some beading. We will complete the top in the class and you will get lots of hints, tips and suggestions for completing the quilting and embellishing. I love making these quilts because the piecing is so easy and I love the long narrow format. Great for the end of hallway or narrow places like between doors or behind doors. I also like how easy they are to quilt on my machine because they are so narrow. And you don't have to do too much beading because they are narrow and I'm willing do do lots of dangles and fun stuff with the beading. Whenever I get in a rut or have a block about what to do next I make one of these because they are fun and easy for me, and I love the end results. Here are two examples of strata quilts that I have made (and I have made quite a number of them!). The first is "Free Spirit" which started with a piece of hand painted raw silk and also incorporates some rusted Thai silk and rusted cotton. The second one is "Sunny Disposition" which started with the flower fabric. If you enjoy playing with fabrics and color and you would like to learn more about combining them in a pleasing, artistic way, come and share some time with me and have some fun making a Strata Art Quilt!